It’s fun to play games on your lunch hour isn’t it? At lunch time, you want to play small games that play in 30 minutes or so and you want a food that you can make quickly and take with you…a nice “on the go” food, right? 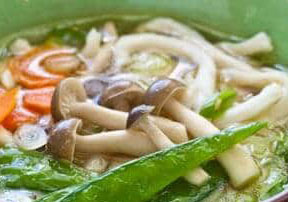 So, here’s a tasty recipe for a Miso Soup you can make at home, but it’s got some noodles and extra veggies added in to fill you up and keep you going for the second half of your work day! Enjoy! And as usual, if you make this tasty soup…post pics and tag us on social media!